There is another little problem I see a lot: How does one resize and/or crop an image to a specific custom pixel size in order to post it online somewhere, or to send in an e-mail, or whatever? Of course, most online services and social networking sites will automagically resize and compress your images for you, and the they often even let you crop the image right there on their site. But, sometimes you need to create an image of a specific size, like when creating a Facebook-friendly image. Fortunately, it turns out that there is a fairly easy and completely free way to do it without any extra software! So, let’s get started. First, you’ll want to open Explorer (aka My Computer, aka Computer) and go find the image you want to resize. 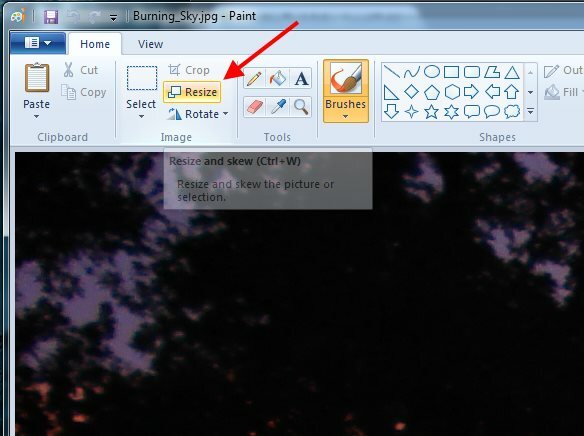 If the image you want to resize is on your desktop, you’re already there. 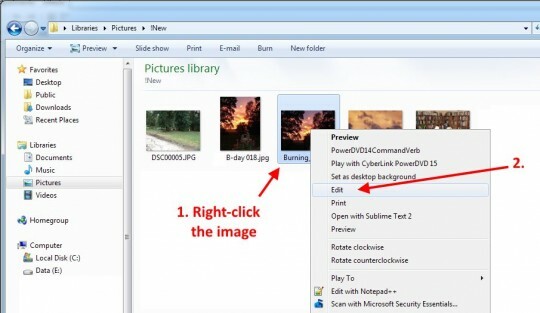 Next, right-click the image, and choose Edit in the popup menu. If that looks okay, jump below to the Save As step. In the case where your image looks too stretched, you’ll need to resize and then crop the image. 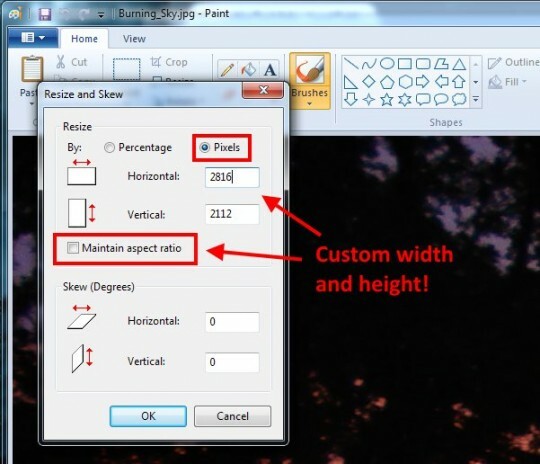 The easiest way to do this is to resize the image to the width you want, and then crop it to the height. 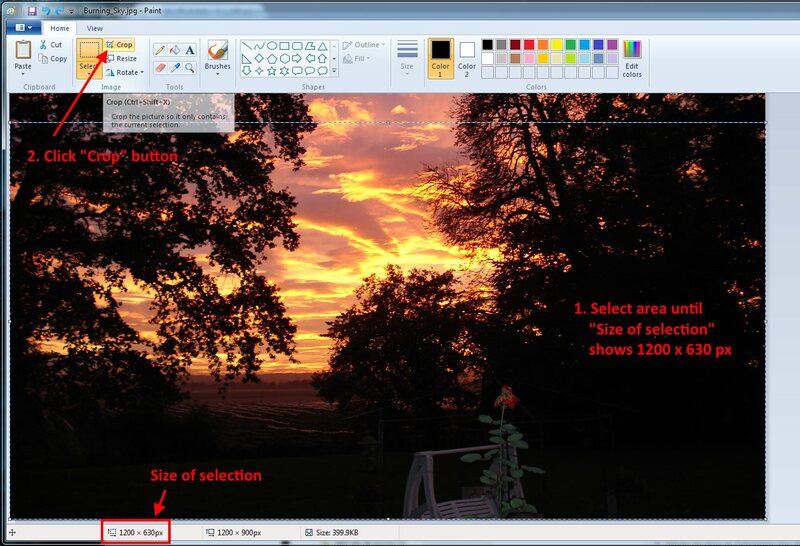 Now, you click and drag to draw a selection box on the image. 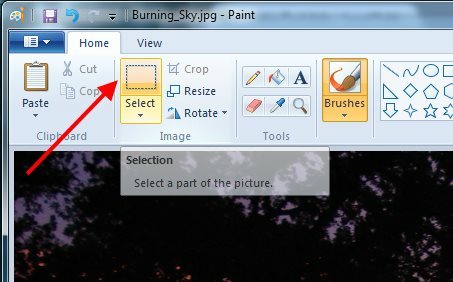 Pay attention to the pixel size of the selection (lower-left corner of the Paint window). You’ll want to keep dragging until you hit exactly 1200 x 630px. In the example below, I looked at the image and realized that I’d rather chop off the top of the image instead of the bottom. So, I started selecting at the bottom left, and dragged up to the top right until I hit 1200 x 630px. When done selecting, click the Crop button. If you screw up the selection, just press the Esc key on your keyboard, and try again. 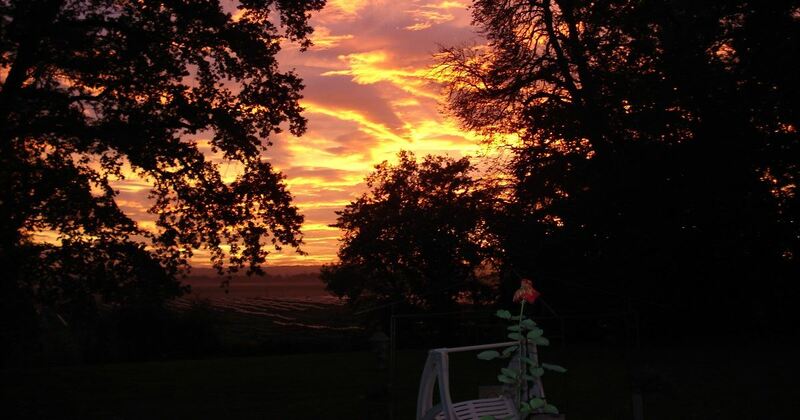 Okay, so this wasn’t quite as a easy as you’d hoped… The cropping part can be a bit tedious. There are certainly other image processing software applications out there that make the task a bit easier. But, this method is free and built-in to Windows. After you’ve done it a few times, it becomes second nature. If you’re looking for a bit more fanciness in your image processing, though, check out Paint.net (which is also free). 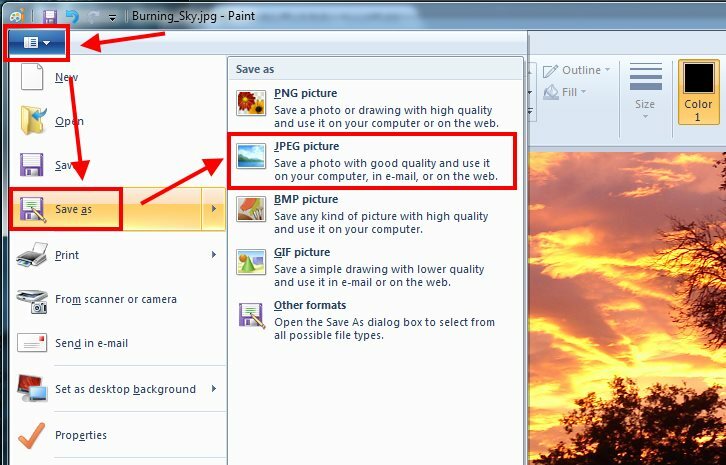 You can read Paint.NET: The Photoshop Alternative for the Rest of Us for more info. Νο good. There used to be a utility from the XP days that used to work all the way up to 7 (never used 8.x so can’t comment). It was called something like “Image Resizer Power Tool” or …can’t exactly remember. After installation it would add a “Resize” entry in the right-click entry which would work wonders with single or even a batch of images. It had wonderful features like resizing to a resolution for a predetermined usage (mobile, email, document, presentation, etc.) 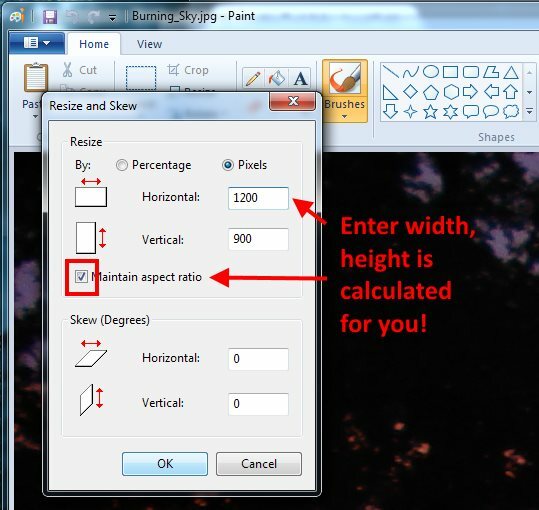 or to shrink/expand based on a given DPI/pixels, size or even percentage. Now Windows 10 cames along and for free and it broke all that, cause that little nifty utility won’t work anymore. Still Micro$oft refuses to add a resize utility in the OS. PIXELS!!??? I just want to crop a photo to make a 4×6 print. Jeez. I guess I have to go get a ruler and hold it up to the laptop screen to see if my photo is in the 4 by 6 dimensions that it needs to be??? I hate Windows 10 so much. Thanks a million, I’m a newbie to websites, the mud is slowly clearing! (I used to think I was quite smart – windows 10 and websites are proofing otherwise. Awesome !! You deserve an exceptional “Thank You” !! THANK YOU!!! UGH…THAT TOOK ME WAY TOO LONG TO FIND THIS POST! YOU ROCK! Really great post! I also love the KrojamSoft PhotoViewerPro program. Buy a Mac: Option + or – That’s it. How many pixels make a centimetre? I know the photo size I want, but only in cms, not pixels.